Welcome to GeoManiaWorld and the exciting and adventurous world of Geography! Here you will find many articles and resources on a variety of topics and issues related to geography from the perspective of an enthusiastic geographer. If you like learning about the world, are seeking to build or strengthen your geographic literacy and knowledge, or just want to have geographic fun, then you've come to the right place. 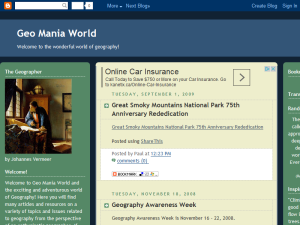 This what your GeoManiaWorld - The Wonderful World og Geography Blog Ad will look like to visitors! Of course you will want to use keywords and ad targeting to get the most out of your ad campaign! So purchase an ad space today before there all gone! If you are the owner of GeoManiaWorld - The Wonderful World og Geography, or someone who enjoys this blog why not upgrade it to a Featured Listing or Permanent Listing?